A couple of years ago, we made a bunch of cooked sugar fireworks to top our 4th of July cupcakes, which were originally inspired by a volcano that we made for Randa's birthday. Once you get the hang of it, cooked sugar is so fun to work with. This year, we did a cake. We used this Lollipop recipe from the Science of Cooking Website to create the sugar mixture. The entire process if fairly simple. -Cook the sugar solution on the stove (sugar, water, corn syrup and cream of tartar) to the Hard-Crack stage. This takes less than 10 minutes. -Then mix it with gel food coloring. -Drizzle onto Silpat or parchment paper lined cookie sheets, reheating as necessary to keep it thin. -I let Joey (9 years old) do some of the drizzling, but you should definitely be super careful with this stuff. It is molten. And will stick to you. Which hurts. A lot. So, use your best judgment. -During this project, we learned about mono and disaccharides, crystallization and interfering agents. -We also learned that all the different stages of cooked sugar (at least from the Soft-Ball to the Hard-Crack) are just variations on the amount of water still left in the solution. Which brings me to my most recent Don't Do What Donnie Don't Does- Don't rely on temperature alone to determine whether the sugar solution has cooked long enough. My first batch was way droopy because I adjusted for high altitude (like instructed) and only cooked it to 290 degrees. And the second batch still wasn't quite done at 300. Use the Cold Water Test when you think you've made it to the right stage. If the strands of sugar are brittle and not at all pliable, you're there, otherwise, keep cooking. Jenny took some fun pictures of the drizzling process. -Have all the cookie sheets covered with parchment paper or a Silpat BEFORE you start to cook the sugar solution, because once it's ready, you've got to move quickly. -I suggest mixing up the colored batches in heat resistant, microwave safe bowls, with handles, if possible. It's best to have these ready, as well, before you start cooking the sugar. -A thermometer really comes in handy for this project. Though, it doesn't need to be a candy thermometer. Just one that goes up to 300 degrees. -If you're using a thermometer that doesn't stay attached to the side of the pan, make sure to clean and dry it completely before returning it to the pan each time. Dried sugar on it will act as a seed and make the whole thing harden up into crystals. -I would suggest turning down the stove as you approach the correct temperature. It'll take longer, but it will also give you enough time to do the Cold Water Test without too much worry that you'll over cook it. -I like the Silpats because they're reusable, but unless you already have one, parchment paper works perfectly well. -Don't bother letting the sugar solution cool to 275 like the recipe says. Just immediately mix with the coloring and drizzle, and it will be a nice thin consistency. -The unpoured sugar will start to thicken as it cools, though. Put it in the microwave for a few seconds at a time and stir it thoroughly to soften it back up to a drizzleable consistency. -If you're going to stand them up on the cake like I did, make sure to drizzle a good, thick base. -You could also just make them without the base and lay them flat against the cake (either on top or on the sides) after they've cooled. Hi there Wendy. I found your link from Angry Chicken's Blog. I love your Fireworks Cake Toppers. I'd love to do something like that, but I'm a bit intimidated by it lol. They're just beautiful though, excellent work and what a wonderful homeschool lesson! These are awesome Wendy! What a fun project, and they look great too. I am going to have to try this out someday. I LOVE this! My husbands birthday is July 6th and we're having a 4th of July/birthday party for him, I will have to add these to the cake! That is really way too cool. I made a typo, so figured I re-write the whole thing. Those are so neat. That looks awesome! Really, really cool. Happy 4th to you and yours - looks like you are well prepared! How fun are those! I am definitely saving those up for when I have kids. Wow.. Looks great! Happy 4th of July! Oh my goodness - I think that is the coolest thing EVER!! Thanks for sharing! Oh so sad I missed these for the 4th. Wonder if you could do something similar for Christmas? Star shapes, perhaps? Maybe I will try that. Thanks so much for sharing. I did this and it turned out fantastic. Tomorrow we are having a 14 year old's birthday party and it is a campout with night games, bonfire, and fireworks. I made a sheet cake and put up a tent on it w/sleepover figures out of twinkies (cut in half the long way), marshmallow pillows and nilla waifer decorated heads, then there's a bonfire of crunched oreos, red fruit roll up flames and nestle stix logs, and theres a ghost with her picture on it and a pepperidge farm cookie grave that I wrote RIP ALEX on w/cookie marker. The finale to it though are the fireworks. I made them onto skewers and put them up all over the cake so they look like they're in the sky. This idea made my cake!!!! Thanks for the idea. Oh Anonymous, that really does sound fantastic! Really, so creative. Do you have pictures of it somewhere? 'Cause I'd LOVE to see it. Those are GREAT! I can see them in other colors, too--wild flowers for a garden party. What fun! oh the possibilities are endless! i love it!!! super brilliant!! 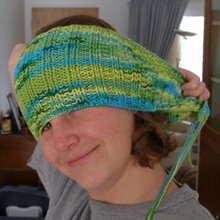 I posted a link on my edible crafts column to hopefully bring you even more clicks (ediblecrafts.craftgossip.com). I found this via craftzine.com. Wonderful! Mind if I post a link on my blog? I found this via edible crafts gossip. What a fantastic idea, and thanks for sharing. J&S, heck ya can post a link. And feel free to use whatever picture you'd like. Wow, I love it! I'll be linking too-these are FABULOUS! That's pretty wild stuff. Never seen cake toppers like that before & I've eaten my share and then some of cakes over the years. These look awesome! Thanks for sharing the tutorial! I am in love with this idea!!! I'm thinking flowers would be a good application, too. I linked to it on my blog here. Thanks! Very cool! Love their translucence. Hi Wendy. Its Bonfire Night here in the UK and both my husband and son have birthdays this week. This is the first year my son has finally got over his fear of fireworks and we have been able to give him a fireworks birthday party, just like his Daddy used to enjoy. This cake decoration looks beautiful and I had a good go. Managed to burn the sugar solution, so it was more of a treacly effort than your jewels - but I'm not deterred; will have another go one day. Thanks. Oh, and the boy's cake? A box of rockets: Madeira cake surrounded by chocolate fingers for the box, swiss rolls with ice cream cones for the rockets. I'm definitely going to have to try these Fireworks Cake Toppers soon... either for Memorial Day or Fourth of July. And there's always Labor Day too, I guess. Please let me know if it would be okay to link to some of your projects from my site. No problem, Rachel. Link away! I just came across your blog today. I'm excited to look around some more. Love these fireworks! What a fabulous idea! I'm just curious, and hope you still check this so I might get a reply. Was it difficult to clean the hardened candy off of the saucepan? What cleaning method would you recommend? I only ask so that I'm prepared before I start the project and become overwhelmed. Thanks in advance! Ivy, these are pretty hard to clean if you're in a hurry. However, if you have time to just let everything soak in hot water, all of the sugar dissolves, no problem-o.